Strip your existing cabinets and repaint them. 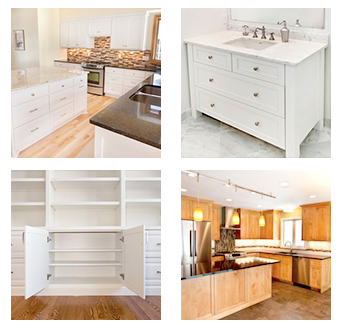 You absolutely get the most bang for your buck by keeping your existing cabinetry. A new color or fresh coat of paint or stain will go a long way for changing the overall look and feel of your bathroom. Put your money where your hardware is. Swap out those old, grimy knobs from the 60’s for bright, contemporary knobs and pulls. Or go for something more out of the ordinary, such as picking up old door knockers at your local antique store. It’s amazing how these small details make such a great impact. Increase efficiency on the inside of your cabinets. The inside of your cabinets offer just as many opportunities for updates as the outside. For example, swap out a basic shelf for a sliding shelf, or add hooks and hangers for wash clothes, sponges and other items. Get a small cabinet custom designed for a unique space. Adding one custom-built item to your bathroom will create a talking point for guests and will help you make the most of your bathroom space. This allows you to add great personalization while also increasing storage space. 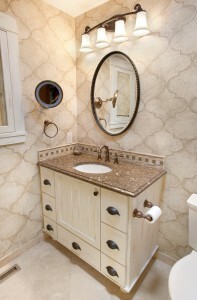 Common spaces for custom cabinets include under sinks, over toilets and in corners. Change the light fixtures and type of light. Yes, we realize that lights are not cabinets. But, trust us; the lighting you use in your bathroom greatly affects what your cabinets look like. For example, a harsh light can take the beauty out of any space and wash out any natural colors. Whether you’re looking to renovate your master bathroom or your half bath, call our Minnesota cabinet design team at 952-737-7088 for more great ideas to help you make the most of your bathroom cabinet remodel. We’d also love to hear from you in the comments section if you found a smart way to update your cabinets on small budget. Happy renovating!